I’m beyond excited to have Ala on the blog today for a number of reasons – 1. she’s an insanely talented writer who always cheers me up with her stories. 2. her cookies are amazing, check it out here. And 3. her recipes are all awesomesauce! Ala and I met through #SundaySupper and I’ve fallen in love with her site since day one. 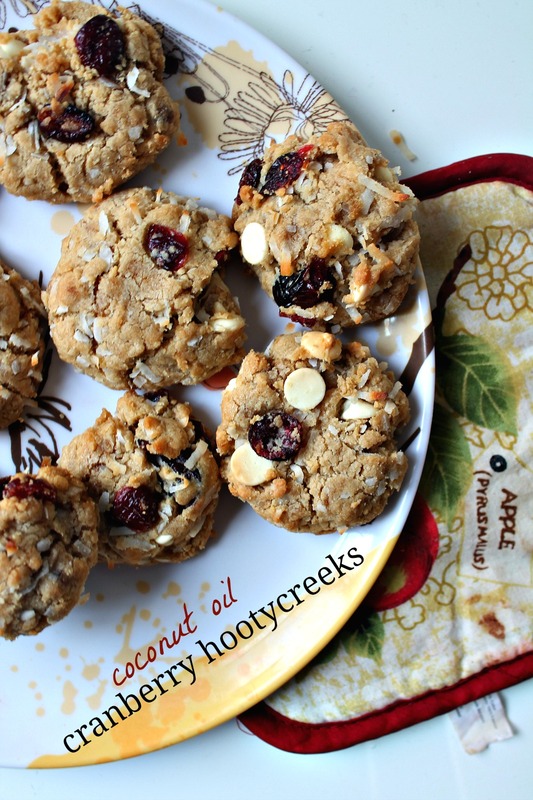 She is smart, caring, and we both share the same love for cookies… and look at these coconut oil cranberry hootycreeks! I am seriously going to start asking for some samples to be sent to me when she does another post here. Ala, I’ll take 4 please 🙂 And thank you so much for this delicious recipe! Salutations, lovely Brunch with Joy readers! It’s SO nice to meet you all–I’m Ala from Wallflour Girl, and I am so thrilled to be here! And I’ll tell you why. Linda and I met a few months back through Sunday Supper–as you know, she’s one of the loveliest ladies on the planet, and I immediately fell in love with her vibrant blog. Since I began blogging back in 2012, I’ve had the chance to meet so many amazing people like Linda from every nook and cranny of the internet. More recently, however, I’ve had a chance to encounter new folks with global experiences just two strides away from my doorstep. I distinctly remember our first meeting when we were partnered up in a windowless, fluorescent-lit room on the upper story of the dorms. M was an international student from Malaysia, visiting the US for two years to complete her Master’s in Public Policy before returning to her home country. When we saw our matching index cards–“Peanut Butter” and “Jelly”–I admit that my heart sank just a little bit into my stomach. I had hoped for a fun, cheery match-up; M, with her wary smile and heavily accented English, looked anything but. But–as program participants, we were in this together for a full year. It was in the contract . And it was the best thing that could have ever happened to me. Our first mandatory “hangout” was pleasant but awkward: we each made food (tofu spring rolls from me, stiry-fry noodles from M) and shared it over a rickety picnic table outside on the dorm lawns. Our second hangout was better–I invited her to my place and we shared another meal. It was bigger. There were cookies. Our third, our fourth, our fifth–the meet-ups began to blur together as the year flew by, and suddenly we were immersed in deep late-night conversations about our lives. M, I learned through her stories, had been a full-fledged doctor back in her hometown. The constant threat of violent outbreaks, instability, and unpreparedness for natural disasters meant that she had spent weeks at a time at the very heart of disaster zones, falling asleep from sheer exhaustion after 48 straight hours of tending to the injured and dead. Like the victims–her patients–she never knew where she would get her next meal or whether the next bombing target would land on the very spot where she stood. Compared to M, I feel incredibly sheltered–stunningly privileged–wildly naive–and infinitely grateful. Last June, M graduated and she left for Malaysia, prepared to better the world around her and continue brightening the lives of everyone whose path she crosses. Those unforgettably wary eyes from our first meeting remind me not to judge someone before I hear their story, while her cheery optimism keeps me hopeful that we can continue forging these incredibly important global ties every single day. Today, I am a second-year participant in the global family program and so lucky to know not only my own sibling (a very cool business student from Venezuela!) but the rest of my extended family as well, domestic and international folks alike. Last quarter, we had an ice cream sandwich social at my place; drinks and peanuts at another sib’s house ; did a locked-room escape puzzle as a team; celebrated birthdays with impromptu cakes. There is something about meeting people who gone a long, long way from home that makes you want to be fast friends. We spent this afternoon sipping Thai iced tea and coffee on a patio at the international center, introducing one another to all of our other friends and filled with a deep sense of clarity that we all shared a common purpose, even if it was just to celebrate five glasses of free school drinks in a row. There was none of the jealous guarding of friendships that I have sometimes experienced with other, more established friend groups–just an intuition that we were all wide-eyed vagabonds, looking for a community of like–and open–minds. So that, dear readers, is the really long story of why I really am so glad to be sharing this recipe and post with all of you today here at Linda’s wonderful blog. She reached out to me and I reached back: she is proof that people from such different little corners can find each other and celebrate in the most unexpected places! And the next time I see her (which I hope won’t be too far in the future! 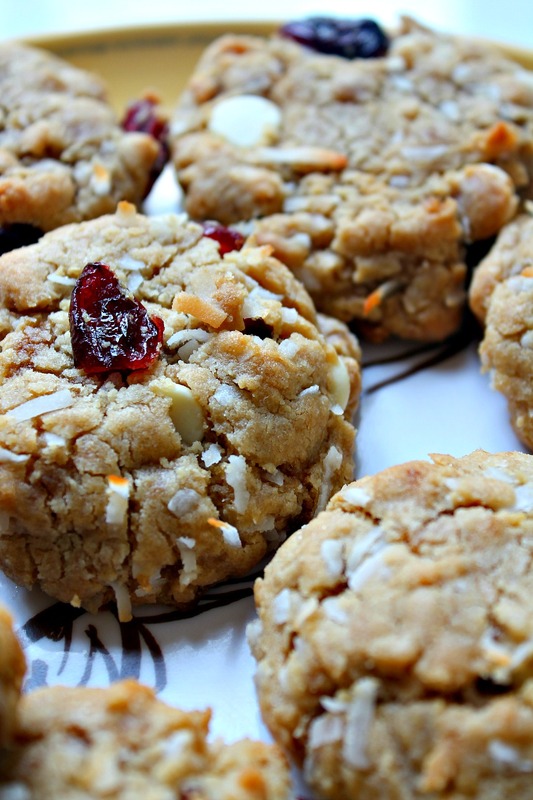 ), I think I’ll bring some friendship cookies like these Coconut Oil Cranberry Hootycreeks. There’s a flavor burst from the coconut oil and shredded coconut packed into these cookies that makes them “unexpectedly amazing,” just like our friendship. So here’s a raised glass of milk and a package of cookies to you, Linda and lovely readers! Have stories of unexpected meetings you’d like to share? I’d love to hear them in the comments! Add melted coconut oil and both sugars to a large mixing bowl. Cream together until well combined, beating for approximately 2-3 minutes. Mix in egg, egg yolk, and vanilla. Add flour, cornstarch, baking soda, and salt. Stir into wet ingredients until just incorporated. Your dough will be quite clumpy at this point–this is totally perfect! Gently fold in coconut, chocolate chips, and cranberries. Chill your dough in the refrigerator for at least 3 hours before baking. After your dough has chilled: Preheat oven to 350 degrees F. Lightly grease a cookie sheet. Remove dough from refrigerator and allow it to sit at room temperature for 10 minutes before handling, since it will be quite hard and crumbly. Scoop out a rounded tablespoon of cookie dough as best as you can with a cookie scoop or spoon. Shape it into a round ball–at this point, you will need to do quite a bit of packing with your hands, as the dough is SUPER crumbly. (Don’t worry, though–it’s totally worth persevering at this step! The balls do not need to be perfect.) Place two inches apart on prepared baking sheet. Bake in preheated oven for 8-10 minutes, until outside has just set (the bits of shredded coconut poking out will turn golden brown) but centers appear slightly underbaked. Remove from oven and allow cookies to cool on cookie sheet, on the stovetop. They will finish baking up, so make sure you don’t skip this step! Your cookies, when cooled, will be slightly crumbly (which is good!) and astonishingly delicious, so handle with care. Love a cookie jam packed with all these flavors. Great recipe! Thanks, Brianne. Ala is such a creative baker. Yum yum, these look so amazing!!! Thanks, Anna. Ala never fails to amaze me, including this recipe. Ala’s recipes are always winners! And this one is no exception. Super flavor, lover the photos. Thanks. I totally agree with you. Isn’t she awesome? Hope you get a chance to try this. What a sweet story. It’s so true that sometimes we find friendship is the most unexpected places. 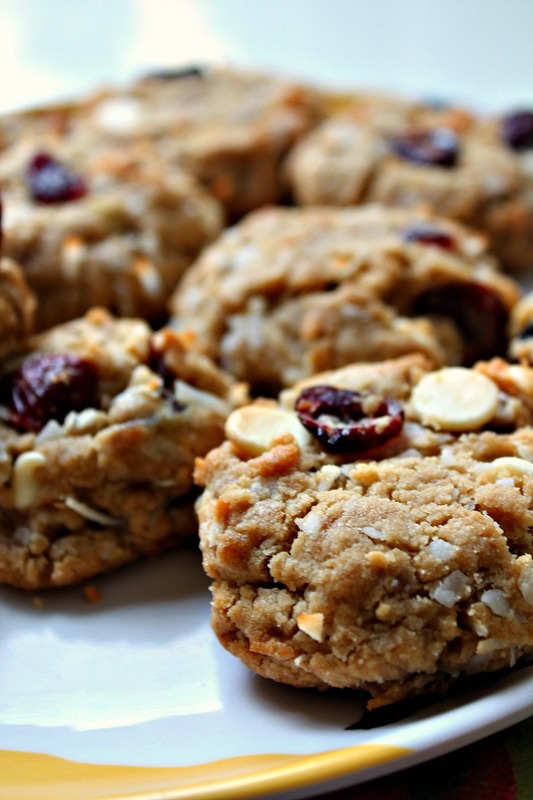 Truthfully, I have no idea what a hootycake is, but I can get on board with a coconut packed cookie! First of all great cookies!! And second thanks Ala for the introduction to a wonderful new blog! I can’t wait to explore more. Finally, I creepily have a similar story with one of my best friends. We met over ten years ago in high school and we were both forced to hang out as we were the only ‘colored’ kids in the room. She and I reluctantly struck a friendship that has now withstood continental moves, several boys, deaths of parents and marriages. I still think back to that faithful day if we had just walked away. Awww thanks Zainab. I’m so happy you found me here 🙂 And thanks for sharing your story, too. What a great reminder to keep an open mind. Ala, another well written, captivating post. 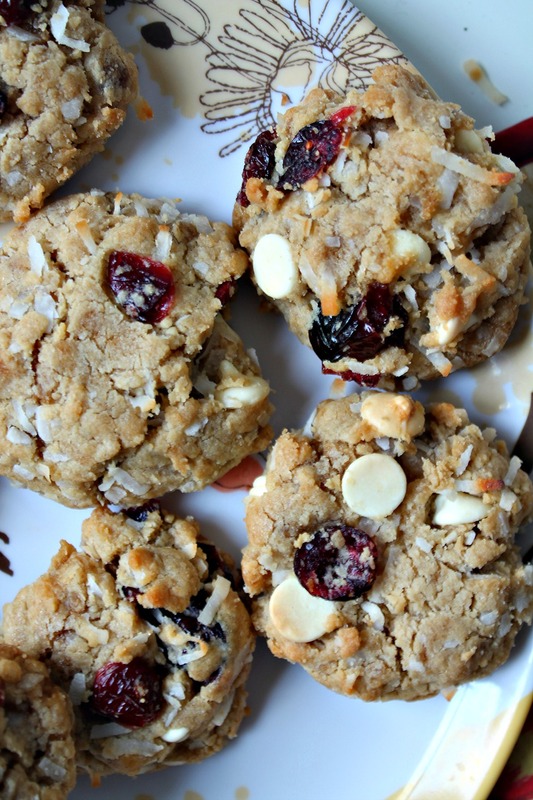 And your cookies look right up my alley–love the combo of coconut, white chocolate and cranberries!! So glad to find Ala here today, Linda!!! Isn’t she amazing? Hope you get a chance to try some. Thanks, Kelly. Cheers to a beautiful friendship! You should, Lorraine. Ala is a wonderful blogger and friend.